Gallia Academy junior Alex Barnes (5) blocks a spike attempt in between teammates Maddy Petro (20) and Taylor Burnette (right), during the Division II district semifinal on Wednesday in Londonderry, Ohio. Gallia Academy’s Peri Martin (7) sets teammate Maddie Wright (22) up for a spike, during the Blue Angels’ setback on Wednesday in Londonderry, Ohio. LONDONDERRY, Ohio — A champion vs. champion bout that turned out to be an instant classic. 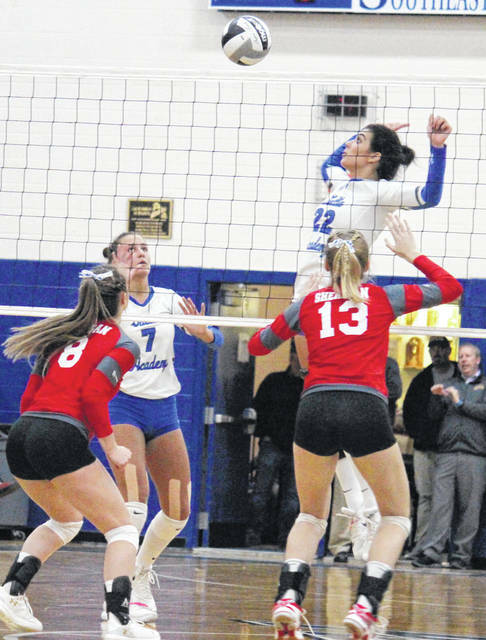 The Gallia Academy and Sheridan volleyball teams — champions of the Ohio Valley Conference and Muskingum Valley League respectively — battled through five games in the opening Division II district semifinal inside Southeastern High School’s Larry Jordan Gymnasium on Wednesday, with the top-seeded Lady Generals edging the second-seeded Blue Angels by two points in the deciding game. Gallia Academy (21-4) never led in the opening set, as Sheridan (22-3) opened up the largest lead of the night, at 17-6. The Blue Angels battled back to within four points, at 22-18, but ultimately dropped Game 1 by a 25-20 count. GAHS fought through one tie and never trailed in the second game, leading by as many as eight points, at 15-7, 16-8, 21-13, 24-16 and finally at 25-17. The first lead change of the night came in the third game, as the Blue Angels led initially, but surrendered five of the next six points. SHS built its lead to 16-10, but the Blue and White battled back to tie it at 18. 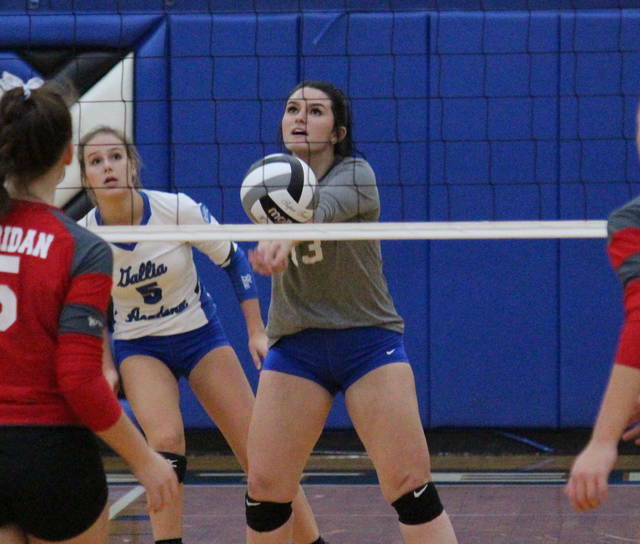 Gallia Academy tied the game two more times, but never regained the edge and fell by a 25-21 count. The fourth game featured a pair of early lead changes, with GAHS taking the edge for good at 4-3. 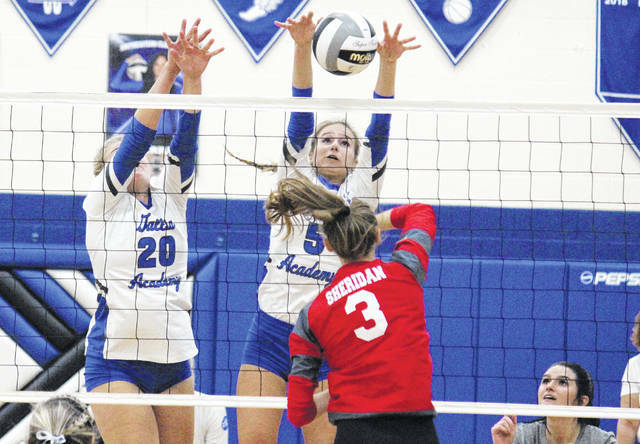 Gallia Academy — which hadn’t played in a fourth set all season — led by as many as eight points, at 17-9, and settled for the 25-20 win to force a fifth. Gallia Academy led at the beginning of Game 5, but Sheridan fought back to take the advantage at 9-8. The Blue and White went ahead 10-9, surrendered the next two points, but regained the edge at 13-12. The Lady Generals claimed the next two points and moved into a match-point situation, at 14-13. 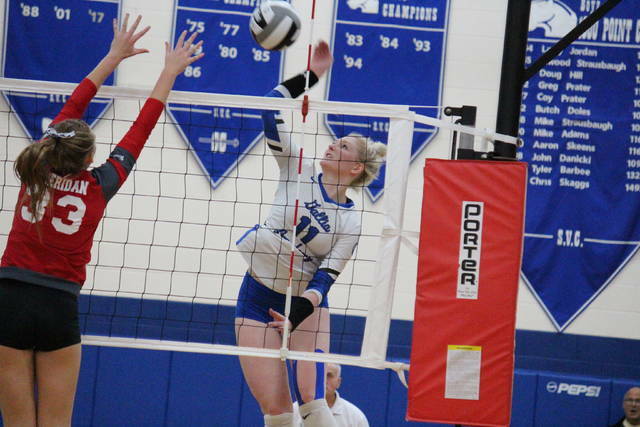 The Blue Angels were the first to 15, scoring the next two points, but Sheridan reeled off three straight to take the game by a 17-15 count and the match by a 3-2 tally. 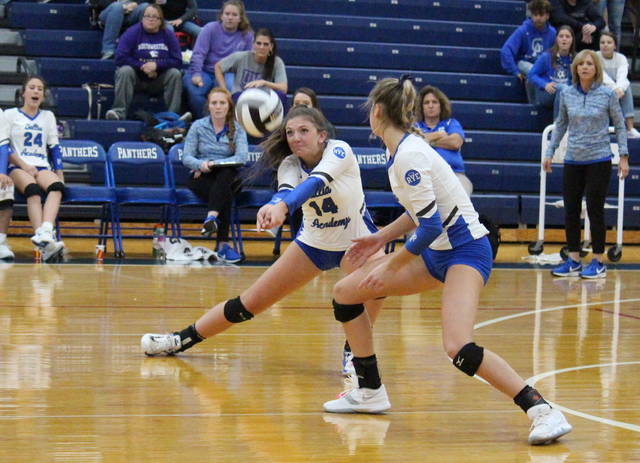 Following the hard-fought setback, fifth-year GAHS head coach Janice Rosier admitted there wasn’t much more her team could have done in the match. In the five games, GAHS claimed a 106-to-104 edge in points, and a 53.4-to-52.3 advantage in side-out percentage. The Blue Angels finished with 14 aces and a serve percentage of 87.9, while Sheridan finished with four aces and a serve percentage of 98. At the net, Gallia Academy had 62 kills for a 16.1 hitting percentage, while SHS had 51 kills and an 18.8 hitting percentage. Ashton Webb led the Blue Angels’ service with a match-best 13 points. Taylor Burnette — who had the highest serve percentage on the team — was next with 11 points and four aces. Alex Barnes and Peri Martin finished with 10 points apiece, to go with five and four aces respectively. Hunter Copley contributed four points and one ace to the Gallia Academy cause, while Maddie Wright chipped in with three points. Webb and Barnes led the Blue Angels at the net with 23 kills apiece, to go with three blocks by Webb and one by Barnes. Wright finished with 11 kills and a block in the setback, Maddy Petro added four kills and a team-best five blocks, while Martin earned two kills, two blocks and a match-high 55 assists. Aubrey Unroe rounded out the GAHS net play with one block, while Burnette led the defensive effort with 20 of the team’s 70 digs. 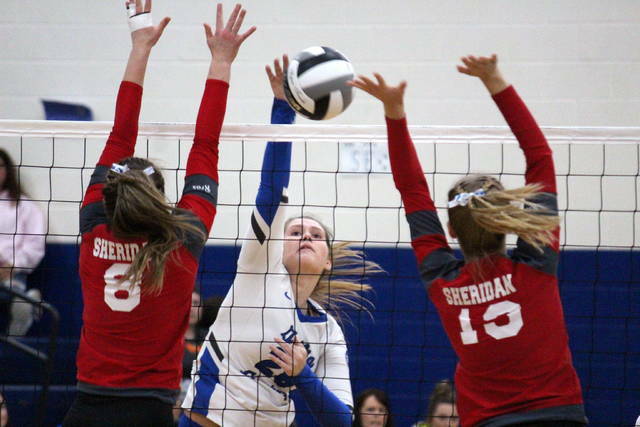 Sheridan — which had only been in one five-game match this season, defeating Logan 3-2 in Thorville — was led by Kendyl Mick with 11 service points, including one ace. Next were Emma Conrad and Grace Conrad with nine points apiece, followed by Robyn Frame with eight points and two aces. Julia Finck had seven points and an ace, Brooklyn Heller finished with four points, while Sydney Amore added one point. Emma Conrad led the SHS net attack with 17 kills — including the match-winner — and three blocks. Mick had 11 kills and three blocks, Heller added nine kills, while Rachel Cooke had three kills and a team-high five blocks. Grace Conrad came up with team-highs of 13 digs and 24 assists in the win. The Lady Generals will meet fellow top-seed Unioto in the Division II district final on Saturday at Southeastern. UHS swept Fairfield Union in the second semifinal on Wednesday at Larry Jordan Gymnasium. This is the final match in the Blue and White for GAHS seniors Taylor Burnette, Hunter Copley, Aubrey Unroe and Ashton Webb. In the last four seasons combined, Gallia Academy has 91 victories, winning at least 20 games in every season. The Blue Angels also have five conference championships and four sectional titles in that span.